Whether you’re a business searching for customers, or a potential employee searching for employment, it takes a little more savvy and a lot more sense to get yourself noticed these days. There is a lot of competition in all aspects of life, and even more tools and tricks being touted as the next big thing to provide you that certain “edge”. Some don’t make it (think Friendster), others explode (think Twitter) and the rest plug along, constantly improving, upgrading and growing to become more and more valuable. Such is the case with LinkedIn. LinkedIn began as a bit of a passive tool, where those in the job market could research leads not traditionally advertised, and where those currently employed could network with others in the same sort of business, watch progress and trends, and browse around for future employment opportunities. LinkedIn has evolved, though, and is now as useful for businesses as it is for employees. Businesses can create company profiles to highlight not only what they do, but how they operate and who they are. The best part is, from your company profile each of your employees then has the chance to promote your business simply by signing up. When you create your company page for your business on LinkedIn you will be asked to fill in several fields and choose from a number of options. Make sure to follow all the steps and provide as much information as possible to get the most benefit from your profile. Use relevant keywords that you know are successful for finding your company online, and be sure to join groups, post often and engage. Allows for building relationships with key contacts at companies with which you’re hoping to build partnerships. Easily connect you with journalists and media contacts for news releases and publications. Your salespeople will be able to stay in touch with leads plus find future prospects. Will provide an idea of who is looking at your page and why. Provides simple to run ad campaigns. It’s a great way to head-hunt for new employees. In Calgary – where Emphasize Design lives but doesn’t solely operate – there are a lot of small to mid-size businesses run by entrepreneurs and innovators. This isn’t a city where people sit and wait for the mountain to come to them…we go to the mountain. As specialists in online lead conversion, Emphasize actively works to find the perfect clients for our customers, and then brings them to you ourselves. To keep ourselves organized, watch our progress and analyze the results of our marketing campaigns, we use HubSpot, which takes the most successful aspects of inbound marketing methods and consolidates them into a central hub. HubSpot helps us identify leads, optimize for searches, test our keywords, send email campaigns, blog and use social media all from the same place. We have been identified by the fine people at HubSpot as first-rate users, and are often named by them as an example of their software should be used. It was a whirlwind relationship and a match that will last a long time. 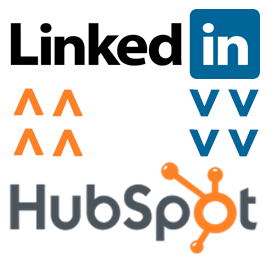 HubSpot and LinkedIn saw each other and knew they had to be together. And on June 17, 2013 they made it permanent. HubSpot is now completely integrated with LinkedIn’s Company pages, making it one of the very first of its kind to do so. We at Emphasize take the examples set by both LinkedIn and HubSpot seriously, and view our development the same way. We strive to be expert enough to provide exactly what you’re looking for, yet flexible enough for your new ideas. Please contact us for more details!